The latest event in the popular Born2Run series was held in Antrim on Saturday morning. Starting and finishing in Antrim Castle Gardens, the 10k route also encompassed Shane's Castle and some stunning views over Lough Neagh. As ever, the club were very well represented with 19 runners competing in the 10k race. Conor Crilly (45:21) was first to finish, followed by Sinead Scullion (47:10) and Kathryn Grant (49:45) while Scott Fleming also dipped below the 50-minute mark (49:58). Also running were Kelly Courtney (50:18), Donna Craig (1:05:45), Lindsay Cunningham (1:07:00), Kate Dempsey (1:08:36), Aidy Dodds (58:29), Martin Harris (1:12:14), John Hood (54:30), Teresa Mark (55:46), Gemma Moore (58:30), Bronagh McCormick (1:06:01), Karen McGaughey (1:05:41), Rosemary Morrow (1:05:18), Elaine Scullion (57:06), Jim Weir (1:01:55) and Janice Wilkins (1:08:37). A further six runners took part in the associated 5k event. John Robinson led the way in 18:06 to finish in 3rd spot overall. Next up, Geraldine Quigley was second lady in 21:03 while John Hasson crossed the line in 29:15 ... with Kevin Duffy (37:05), Judith Irwin (37:04) and Lisa Kirkwood (35:00) also competing. The penultimate Cross-Country fixture of the Northern Ireland League took place on Saturday in the scenic setting of Stormont Grounds. First up was the Ladies 6k event over three tough laps. Paula Worthington continued her fine form over the winter season to finish in an excellent 8th place. Club legend Brigid Quinn again won her age category (F70), 122nd overall while, in her first appearance over the grass, Bernadette Carmichael took 135th. Well done ladies. Ten club members lined up in the Men's 8k event. Leading the way Ben Morrow(12th) looks to be getting back to top form. Next Michael Bennett (26th) with Richard Agnew (54th), Noel Connor (55th) and Seamus Kelly (59th) all having a close team battle. Also competing were Paul Connolly (118th), Peter Faith (147th), David Rainey (171st), Alastair Donaghy (179th) and Terry Foley (209th). Well done guys, it was great to see a few new faces giving it a go and picking up team participation points. 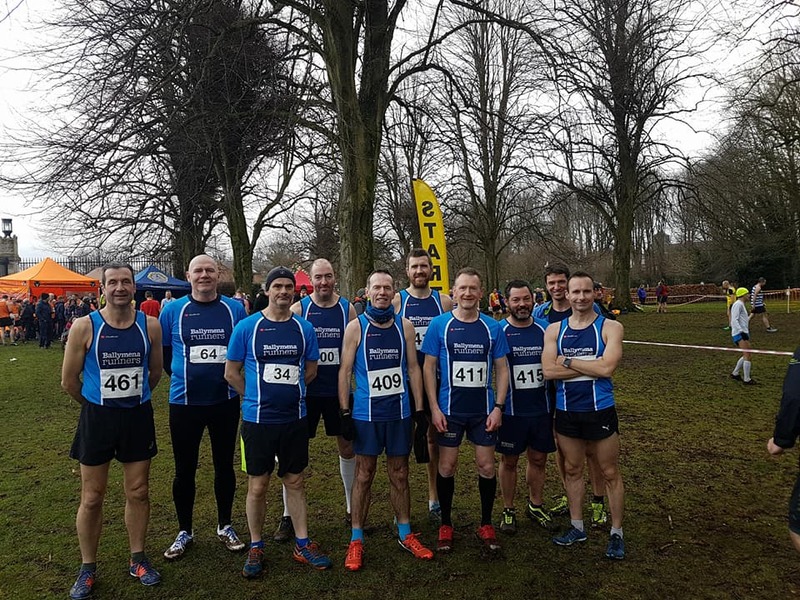 The final event in the eight-race series is the Northern Ireland Cross Country Championships in Lurgan on Saturday 24 February, with double points on offer for team placing and participation. Interested members are encouraged to pass their details to Ben Morrow as soon as possible. 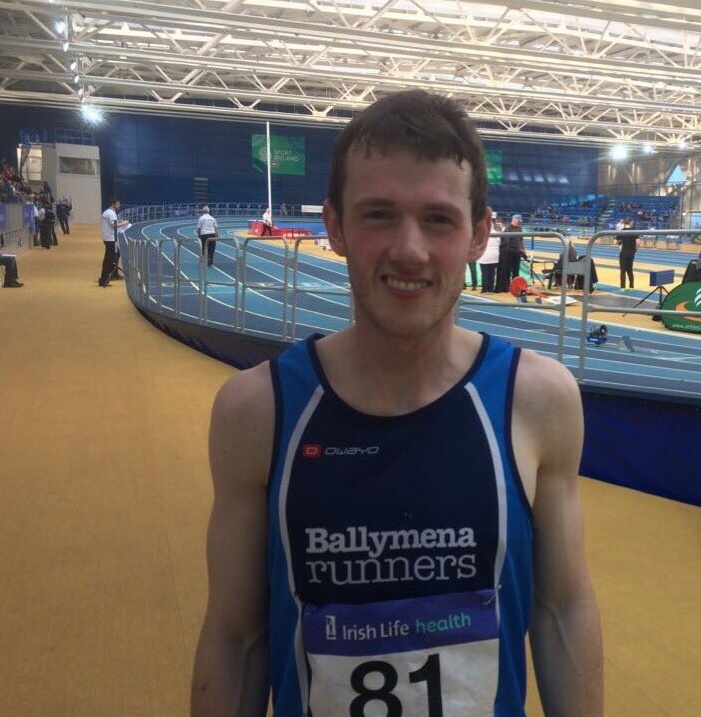 Club track star James Hamilton got his season off to a blistering start with a personal best over 3000m at the AAI Indoor Games on Sunday afternoon in Abbotstown, Dublin. James finished 6th in Heat Two, breaking the nine-minute barrier with a time of 8:54:04. Congratulations James! Three Ballymena Runners escaped to the sun at the weekend to compete in the 29th edition of the Torremolinos Half Marathon. Starting and finishing in the local Municipal Stadium, conditions were perfect for running although the last three miles were challenging as the athletes faced some steep inclines. Neil Douglas led the club charge, finishing 1:22:39 (an average of 6:17 per mile). Also donning club colours for the event were Amanda Strange and Sandy McDermott ... many congratulations to all three runners.